Last month, previous EXP podcast guest Nels Anderson made an interesting claim: videogames have far more in common with television than film. Truly the Citizen Kane of comparisons. Scott and I watch a lot of television, but we're no experts. So this week we thought it appropriate to discuss these two mediums with another guest. Joining us this week is Justin Keverne of Groping The Elephant. We are honored to have such an intelligent blogger and designer in our midst. Justin provides plenty of insight to go around and one of those charming British accents to serenade our listeners. Join us while we discuss format breaks, self-created narratives, short attention spans, and television adaptations. Our hosting triad and the broad subject matter has made this podcast a little longer than normal. Don't worry, it is time well spent. You'll find Nels's original article in the show notes, along with supplemental articles we mention in the show and links to Justin's own work. As always, we'd love to hear your thoughts in the comments section below. - How does the viewing/playing format change your gaming experience? - Do you find episodic games pleasing in the same way as television? 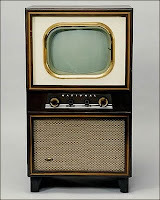 - Are lessons from the television format you'd like to see in games? - Any television to videogame adaptations you'd like to see? The guy's basically playing Mirror's Edge in an episodic way, focusing on different things of the design of the game in every episode, very interesting. For me, Mirror's Edge seemed episodic in a very unique way, just based on the different colors of the levels, a thing which I haven't seen in any other game as far as i remember. In general the biggest problem with episodic gaming in my opinion is, that it seems to be automatically connected to the "let's kill the used games market and force people to buy games at full price" digital distibution of games thing that publishers love so much. Also I actually feel like games moved away from that episodic style in the last couple of years to a more unified, movie-like experience after that very strict "Level 1: Ice world, then Level 2: Fire world etc" way games used to be built in the beginning and now they kind of seem to return to it with splitting the game up into different chapters or releasing it completely episodic from the beginning. By the way Scott, you should play GTA4 , I finished the story in under 30 hours, which makes it shorter than FarCry2. I'm also looking forward to getting that GTA4 episodic content since it'll finally come out disc-based. I finally got a chance to check out the runner blog. It's great, thanks for the link! Good point about the "fire level," "ice level," tradition. I've never really thought of them in turns of episodes, even though we've had those conventions since the 80s.